We left for Australia January 21 and returned home on February 18. We mixed it up, spending 8 nights in a studio apartment with gorgeous Opera House and harbor views, taking the Indian Pacific Railway for four days, three nights across the continent to Perth for a few days; then boarded a Crystal Cruise back to Sydney by way of the West and Southern Coasts, Melbourne and Tasmania. I used to be much more motivated to do travel sketches and I don't know why I was not on this trip. Maybe because we are traveling so much. On our first full day in Sydney, we took a bus tour around the city to get the lay of the land. We stopped at the entrance to the very impressive harbor. A few days later we took a ferry to Manley past this spot. I usually take photos and do the sketch later in my room. I did just one other sketch on this trip. As we left Tasmania, I captured a photo of impressive storm clouds against the rugged coast from our dining table. W are traveling again, so I will post this piece that I drafted sometime ago. I promise more to come. Since 2007, every Monday when I am not traveling, I attend a three hour drawing class by Robert Semans, a master artist for the past 40 years. This particular piece was a setup I brought to class, using a pitcher I bought in England and Floribunda Roses blooming in my back yard. Bob says we paint the light, and I believe I managed that with the dark shadows, reflected light, and highlights. In the fall, some of our favorite still life subjects include the pumpkins, gourds, and corn available at our farm stands. The pumpkin on the left was very interesting with its imperfections. I like that I introduce a touch of green into the dark drape. When Bob wants us to really focus on creating three-dimensional objects, he will have us do just one. 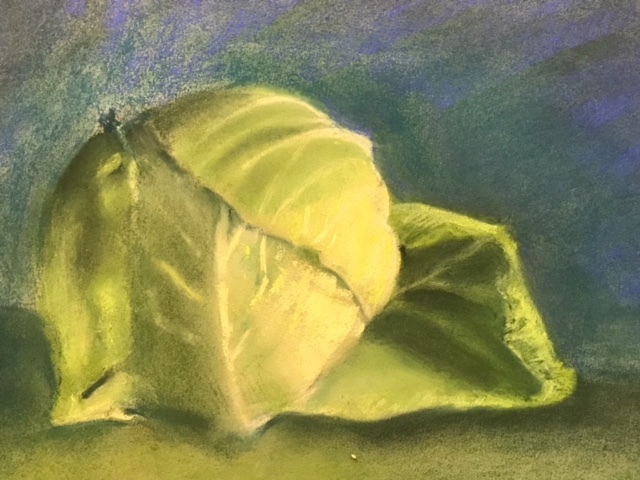 Cabbages and onions are particularly popular with their layers, odd shapes, and the subtle way they pick up the light and shadow. Friend Susan brought this setup from her kitchen. We enjoy doing glass and it is always a challenge. Here we had transparent, opaque, and a jelly jar with contents. The orange of the Mandarins nicely balance the neutral shades and the colors in the jelly jar. As Bob will tell us, light is everything. Note the various highlights that help suggest the shape of the objects. Now, sadly, we are losing our class venue. University Arts store is closing it's San Jose store in early May after 70 years in business. The company owns the building and can make more from leasing the space to the motorcycle dealers that rent a portion of the building, than from selling art. As they explained, even the vendors are now competing with them online. Privately we heard that Corporate dismissed the idea of selling online early in the internet revolution. a bad decision. Thus, the employees who don't want to move to a store an hour away are without jobs. This leaves us with just two Aaron Brothers Art stores as the only brick and dedicated motor art stores in Santa Clara Valley, home to abut 2 million people. University Arts was superior to anything that remains. Our instructor is looking for a new venue for our group. We old faithfuls are so bonded with each other and want to continue improving our drawing skills. No other class has helped me as much with my art in all mediums. In January, Bob and I spent three days in Mendocino at the MacCallum House, a BandB with cottages and lovely gardens. We even managed to use our own garden spa in spite of rain and cold weather on the coast. We enjoyed a private wine tour of the Anderson Valley. Bob likes to do Argentine Tango so we went to a Milonga, a dance event for people who dance Argentine Tango, in tiny Casper. People gather in the most interesting places. We also met up with one of Bob's high school girlfriend, special because they attended Austin High School in Chicago! I so enjoyed meeting Sue and her partner. Sue has lived in California many years. Bob and Sue had not seen each other since right after our big Loma Prieta Earthquake in 1989. Sue was then in charge of a large geological group in Berkeley and very busy when they met. That is the background. So what is this painting and why did I paint it? I have always enjoyed patterns and geometrics, so I took a closeup of the "Chickens and Hens" growing near our cottage. Lots of blue/green mixed with a touch of scarlet made a good grey-green for this painting. I am fascinated by how mixing complements can make such lovely greys. I learned most of what I know about color from Stephen Quiller's workshop and books. If you are older than 40, you might recall that this coastal town, 3 hours drive north of San Francisco, was the setting for the moving "Same Time Next Year," one of my favorite oldies with Alan Alda. Spring brings on a desire to paint flowers, so the beat continues. For the past two weeks I have worked on this small piece at Thursday Night Art and at home. These Peruvian Lillies grow in our back yard,. I placed them in a jelly jar with a ribbon around the top and photographed them on my sofa to capture the light. I loved the shadows, the very deep background color, the refracted light, and the abstract pattern in the jar. A few of my faithful bloggers have wondered where I have been. Bob and I have dedicated a lot of time to seeing the world the last few years (well, parts of it), with a month in Australia in January/February our most recent adventure. It has been difficult to get a solid block of time for art, and even less for blogging about it. However, when I am in town I have continued to take my Monday morning drawing class weekly and I paint every Thursday night with fellow artists that I met in my first art classes at a community center. So I do have some art to post. I am starting here with one I finished yesterday and began three weeks ago on a Thursday night. I have a gorgeous Camellia bush on the side of the house that begins blooming early in the year and finishes just about now. In fact this is one of the last blooms. It took me quite a while to hand draw this small painting, but I felt I had to be accurate to do it justice. 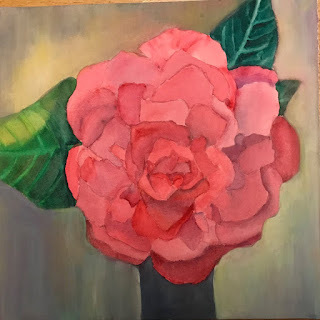 The flower and leaves are all watercolor, but I was not happy with my background and in desperation, I pulled out my acrylics to complete the painting. I was going for simplicity with some suggestion of light ad shadow. "Cumbres and Toltec Steam Train: Comin' Round the Mountain"
Bob is a train buff and I enjoy them, too. So when I planned my Colorado ranch workshop with fellow artist Jeanne, we decided to spend the week before riding two famous steam trains that are remnants of the narrow guage railroads operated by the Denver and Rio Grande Western Railway. The railroad was built for mining operations with narrow guage because it was easier to make tight turns. First we flew to Durango, CO, and then I drove us 2.5 hours to Chama, NM, where we would board the famous Cumbres Toltec train. It travels over 60 miles at a slow pace over Cumbres Pass (10, 015 feet elevation to Antonito, CO, crossing the boarder between NM and CO eleven times in the process. Passengers board before 10 and arrive in Antonito about 3:30. 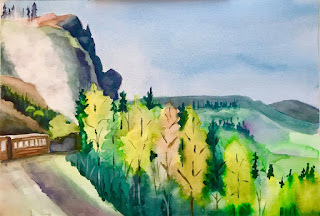 I just completed this painting based on various snapshots taken when rounding Windy Pass. Here is one of several photos. I wanted to capture the steam coming from the train, the long vista, and the colorful trees using knowledge gained at Steven Quiller's workshop. We rode in the beautiful parlor car with a hostess to take care of our needs. Midway we stopped in Osier for lunch in a large dining hall, toured old buildings, left some passengers behind who boarded another train to return to Cumbres Pass or Chama. We continued on to Antonito where we spent the night in the Steam Train Hotel. Antonito is a old, high dessert town, now known for the surrounding agriculture. I was amazed that they produce a large quantity of crops. The town itself had a couple restaurants, three liquor stores, a nice supermarket, a marijuana dispensary, and a Dollar store. Like many towns, it is in a slow recovery from the mines closing. The following morning we made the return trip to Chama where we spend another night at the Chama Station Inn, a sweet, local property lovingly run by a family. 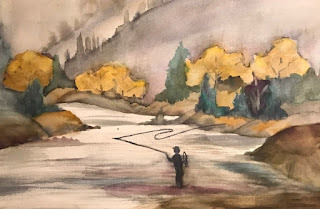 After friend Jeanne and I returned from Colorado, we were motivated to do some plein air painting. 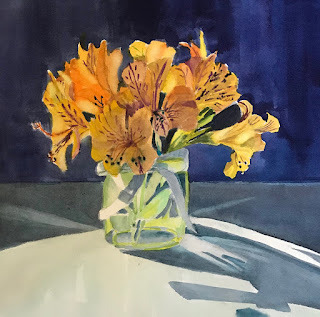 I always love doing it with the watercolor society, but both Jeanne and I live far from many of the locations. With Bay Area traffic, we just have to pass up some places. Because Jeanne was slated for some surgery almost immediately, we had to act fast. I suggested I travel up to the Santa Cruz Mountains where she lives and we find a local spot. Jeanne's favorite location is Falls Creek in the Henry Cowell Redwoods not far from her home. We walked in about a half mile carrying our gear and set up next to the creek shaded by Redwoods. I had to improvise on gear as my workshop supplies were enroute, including my field easel. I carried my wooden French half easel and the Quiller full-sized pallette. When we got done, I was not quite satisfied with my piece. So the other day I pulled out the piece and repainted it. I am much more satisfied with this attempt. I wanted to show the beauty of the place left in its natural state with fallen logs and debris beside the creek. The redwoods are awesome trees and very tall so here we see just the trunks of the three trees. The fall sun was shining in the grove. I used some of what I learned in the Colorado workshop. 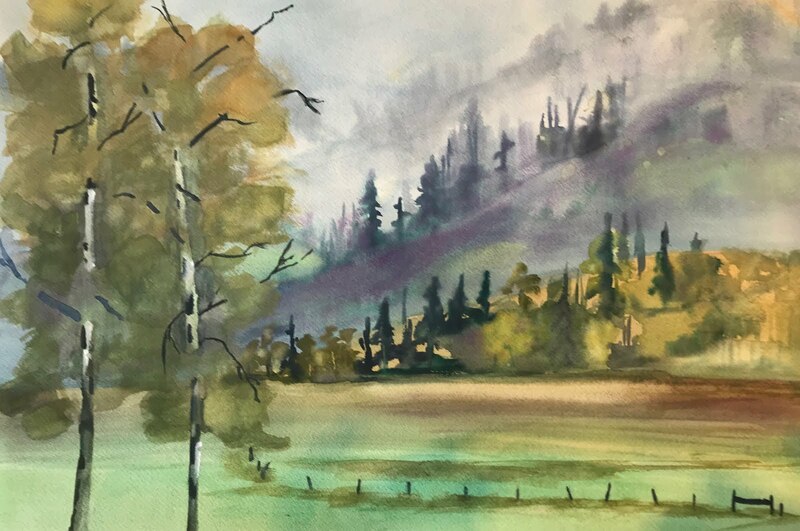 I rather liked the "happy accident" that resulted when I was impatient and did not wait for the paper to dry to paint some of the background trees on the right. I will incorporate that technique in future work! In 2016 we were blessed with the births of two granddaughters who have continuedto delight us from both coasts. Sydney, not in this painting, lives in the DC area and Amelia, with her head in the goat rest area, lives nearby. Both sets of parents have done a great job limiting their exposure on the social media sites and sending grandparents photos along with frequent updates. We marvel at how very quickly the infants became real people. A few months ago, Amelia's mommy sent out photos from a visit to Happy Hollow, a children's park in San Jose with animals and rides. Amelia has visited many times and her favorite animals are the goats. Here she is with her little friend Dierdre. I couldn't resist painting this from Mommy's photo. I loved the way the perspective showed their diminutive size, enhancing the effect of their curiosity. Day 5 dawned with rain and cold. We were a brave bunch, venturing higher into the mountains on the muddy road. At least today, no one ended up in the ditch as one of the car drivers did on Thursday. Fortunately she was able to drive out of it. Steven was set up overlooking a pasture with some cows. 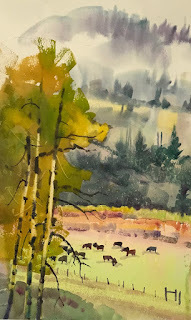 His work include the cows, but I decided to complete this scene sans cows until I practice strokes needed to create a herd. Jeanne and I were soaked to bone by the time Stephen finished. Though some hardy artists remained behind, we went back to the workshop studio. I used Steve's approach to mist with the gouache underpainting. We returned late to "Station 15" as the stretch of Goose Creek is known at about 10,000 foot elevation, so numbered for the ranch fishing lotteries. Two years ago we painted at this station. Today we enjoyed a fish fry done by the chef and his staff. We finished painting at 3:30, saving critique for Saturday morning with our final farewell session. That evening we cleaned up and went to Steve and Marta's home where they hosted a lovely buffet. We got to see Steve's studio, which is a dream come true to any artist, sitting over the Rio Grande and just a short distance from his home, which is beautiful and filled with art. Day 6 started with a buffet breakfast and then critique. By now, some of our fellow students had left to get an early start on their return home. Jeanne and I had plenty of time as we planned to make our 2.5 hour trip back to Durango and stay overnight before flying home to California. After pats on the back for our final paintings, we packed our supplies and took them to the office for shipping. The day was threatening weather for going over Wolf Pass. We experienced some rain, some thunder and lightening, and snow in the pass. We stopped in sweet Pagosa Springs for lunch at a very popular cafe. At some point during the whirlwind week I accepted the wrangler's invitation to go on a trail ride. Four of us women participated. Mind you, I had never ridden a horse, in spite of having granddaughters who own horses in Vermont and one is in Equine Management at UNH. I learned the basics of communicating with the horse and then road up and down hills and through water crossings. I made it back without falling, thanks to a horse who has likely nurtured many novices and could deal with the rider's poor communication skills. 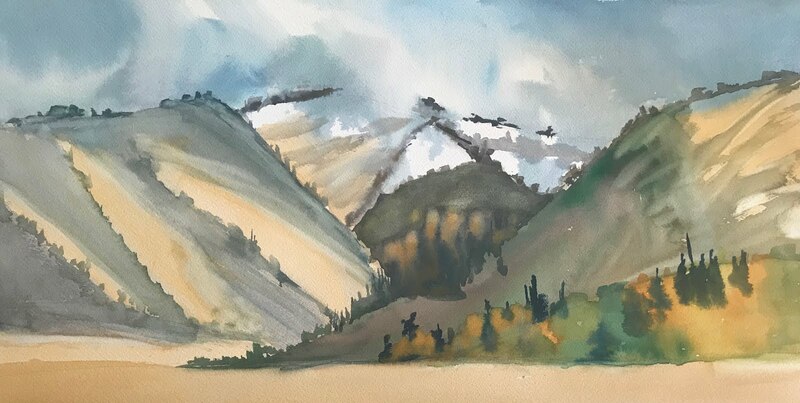 Jeanne and I had such a great time that we decided to do plein air by ourselves on Thursday in the mountains near her home. We also promised ourselves to consider returning to this perfect workshop and ranch in a few years. Twice was not enough!! On our third day at the ranch, Steve arranged for the Chris, the ranch hand in charge of fishing, to do some casting at the Rio Grande that runs through the ranch near the entrance. We would make quick sketches and take photos. Rain was forecasted shortly, so we were planning to return to the workshop building. It was a cold morning and very overcast so not much detail was seen in the distance. Chris chose a spot where he knew he could catch fish and within seconds, pulled out a large one. We admired the fish and then he was returned to freedom. Chris then moved downstream where Steven wanted him to "pose" backed by gorgeous scenery. He quickly caught three more fish. Steven demoed how he would capture the moistness of the morning and we returned to our work space. After lunch Steve braved the rain and painted outside the building looking across the narrow value, capturing a scene of an outbuilding with a white roof. He managed to finish the painting with minimum raindrops included. I watched briefly, but was too uncomfortable and returned to my painting. That evening we carpooled to the town of Creede to visit Steve's gallery and to tour the amazing mural he painted for the local theater. We started getting snow and were told it was about a month early. The next morning we awakened to a beautiful dusting of snow on the valley and some with staying power on the high peaks. Thursday morning we all bravely lined up behind Allie and headed up the now mushy, muddy ranch road toward the hills in the above photo. Steve had positioned himself to paint the old Miner's cabin. By the time we started our own work, Steve was standing in a puddle of water and mud from the warming temperatures. He showed us how to prime the paper with white gouache on the top portion to achive the misty effect. Jeanne and I painted a similar scene from a different perspective and it's one I would like to redo, so stay tuned. Tiring of my poor attempt, I turned to the mountains and painted the scene I showed on my first Colorado post. I used Steve's technique of priming with white gouache to create the sky. I was happy to have Steve tell me to stop and soften a few edges and call it done. He liked the mood I captured with little detail. We arrived at the ranch on Sunday afternoon, enjoyed a chance to meet fellow participants at dinner and an evening introduction. The following morning we began days filled with painting outdoors, delicious meals, and evening sessions in the workshop building. There was little time wasted. Steven began with an introduction to his approach to painting plein air. To familiarize us folks from California, Arizona, Texas, Florida, Connecticut, and other states with the landscapes of Colorado, he had us practice creating the tree shapes in the mountains. These were 30 minute sketches at most. After lunch we queued up behind Steven's very able assistant, daughter Allie, and headed out on the dirt road higher into the mountains. There Steven demoed and then we all tried our hand at creating our first piece. Here is my first plein air piece of the workshop on Monday afternoon. After critique, Steve showed us how he sometimes primes the paper with an acrylic underpainting, this time in Cadmium Yellow. The acrylic will not lift when we paint watercolor over it, and we can easily lift back to the yellow if we want. We then tried our hand at it, and I did the painting at the top of this post. I fought that thing all the way as I selected a more complex scene. The yellow you see is the underpainting. In some cases I lifted back to it. To put in the blue sky, I used gouache and cerulean blue at Steve's suggestion. Here is the scene. As you can see, I was not wedded to every element in the scene. On Tuesday evenings, the ranch throws a cocktail party for guests, so we all gathered round the fire pit outside the bar and had a great chat. Steve's wife Marta joined us. We were also treated to surry rides by Damon, a cowboy who has worked the ranch for 18 years and is raising his daughters on the ranch. Riding in the surry with the fringe on the top. 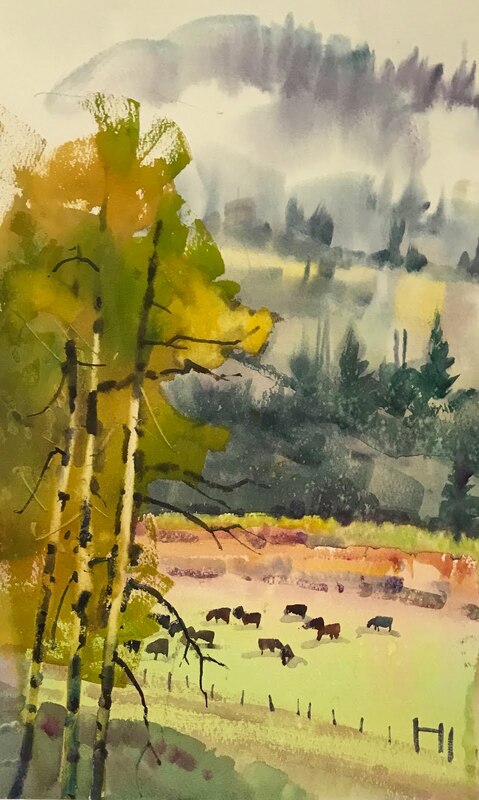 In late September I attended a plein air workshop given by Stephen Quiller, a noted watermedia artist from Creede, Colorado, known as a color specialist who has authored books and DVDs. The workshop was held at beautiful 4UR Ranch near Stephen's home. I went with an artist friend who had attended this same workshop with me in 2015. Again, we were amazed by the beauty of this ranch in the San Juan Mountains. We were treated to beautiful meals, a lovely workshop space, and several fun events. The weather in 2015 was consistently sunny warm days with very cold nights. This year we had entirely different weather, ranging from sunny and cool, to rain, to snow. We found this a benefit, allowing us to learn some new techniques. Steven makes use of acrylics, watercolors, and gouache to interpret the landscape in an artistically unique fashion. His approach to color uses complimentary or near complimentary colors to make colors glow. By mixing these colors, an artist can "neutralize" or "grey down" colors. By surrounding pure color with neutralized colors, I can enhance the effects of the pure color. Additionally, Steven uses thick, dark mixtures next to pure color to make it "sing." Steven also emphasizes using granulating colors in neutral areas and often starts a painting with neutralized, granulating colors[. These colors do not sink into the sized paper, so it easy to lift areas back to almost pure white, as I did in "Snow and Aspens," to add the golden foliage. In other paintings, many of the white aspen trunks and branches were lifted from the background. 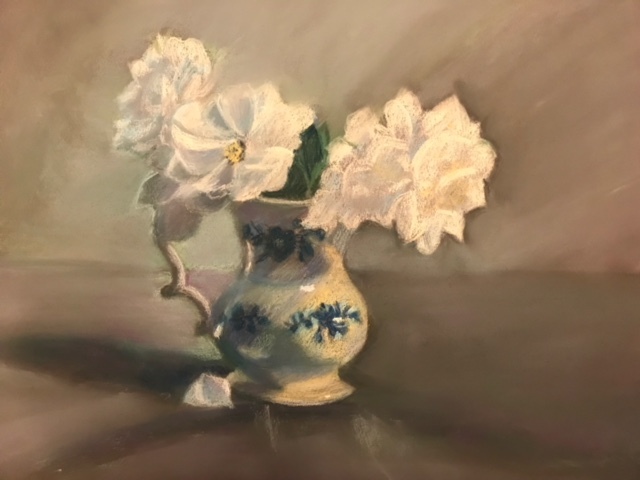 Acrylics make a good underpainting as it will not lift when watercolor is applied over it and one can lift back to the underpainting very easily. He also makes use of gouache and casein with his watercolors to achieve certain effects. In the above painting, done on Day 4 after snow had fallen in the night, I used gouache under the background mountains to achieve the swirling fog and obscure mountain tops. The white gouache mixed nicely with the cerulean blue of the sky. Sometimes Steven uses dry bush techniques, other times he paints wet into wet. He emphasizes how you control the paint application with the ratio of water to paint. When painting into the wet surface, use a dryer brush with lots of pigment. That is how I created the trees in the foreground. As most instructors will tell you don't mess around after applying the paint. "Let it do what it will do" and "It is what it is." Steven uses the landscape for inspiration, but is not a slave to the scene. He told us "listen to the painting." He always approaches each stroke with a designer's eye. He also completes the last 15% of his plein air paintings in the studios so he can "listen to the painting." The next post will show you how we began the workshop and other works created plein air with very stunning vistas. In 2013 Bob came into Monday drawing class to meet me for lunch. He was wearing his orange vest and a hat. Our instructor Bob Semans has become our friend, and the minute he saw Bob, he asked if he would come pose for us. That day, Bob chose to wear his Scottish Balmoral hat that he wears with his formal kilt. Here is is in his full kit. 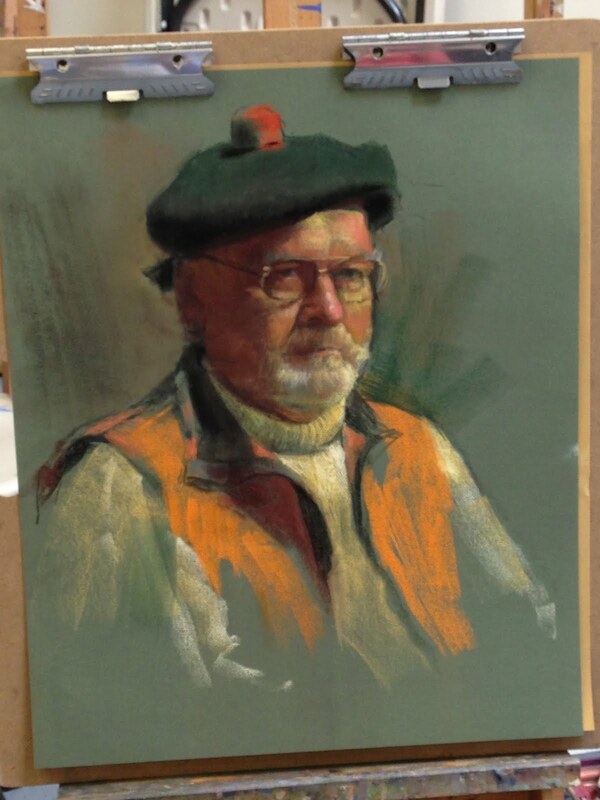 Bob Semans did a demo piece on a large piece of pastel paper and gifted it to Bob in exchange for his work. We students were working on our own renditions, but I only partially finished. I only do pastels in class so I set aside. The other day I found the piece and decided to complete it in our hiatus of working without an instructor while he recovered from surgery. I was fairly pleased with my work, though you can see why Bob S. is our instructor. He gave me permission to post this piece. I was obviously sitting at a different angle. No two are alike. Bob E. by Bob S.
I've been wanting to come up with ways to combine painting and collage with figures. I've painted Lisa Taylor before. She is a marvelous singer from Santa Cruz, CA, and I've danced to her live music a number of times. Her band's Facebook page gives you lots of info. I got permission from Lisa to use photos I've taken of her as subjects for my paintings. I decided to use an unsuccessful canvas that had a highly textured surface. That is the least successful part of this experiment. I painted the background many different ways before settling on simple, then drew the figure in acrylic and painted it. I wanted a modern, flattened approach. I then found some interesting magazine pages for the collage and applied those with glossy medium. This method intrigues me enough to continue experimenting. Next I want to use a smooth surface canvas. I will also try watercolor on Arches with collage. Napa Valley is known as the wine valley in California, but Santa Clara Valley, known today as Silicon Valley, was the first premium wine production region, called "The Valley of the Heart's Delight." French and Italian immigrants brought their vines to our valley during the Gold Rush Era. That tradition continues with at least 30 wineries located here. We belong to two wine clubs and recently enjoyed entertaining guests with Guglielmo's wonderful 2015 Dolcetto. Our drawing instructor is recovery for surgery, so we are meeting on our own at his suggestion. I created a setup with my empty wine bottle, a wine glass, and tea substituted for wine. Pastel colors are such a challenge. I had to mix multiple colors to achieve the shades I wanted.This time friend Susan gave me a sheet of Pastel Mat which can take lots of pastel. I found it a very nice support. Here's to happy sipping at the wineries of Santa Clara Valley. 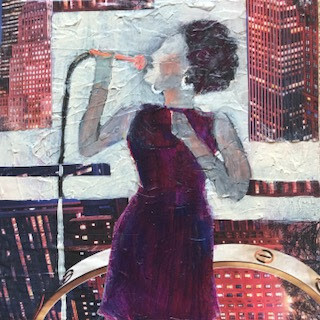 A mixed media artist specializing in figurative, landscape, cityscape, and still life. My art reflects my personal response to the world around me. My inspiration comes from living life to the fullest and includes world travel, bicycle touring, and ballroom dancing. The art work on this site is protected under the Copyright laws and not to be reproduced in any manner. Please respect the work of the artist. Who is Arthur Simo the Outsider Artist?